While the Bulls entered what figures to be a busy offseason, the Toronto Raptors turned their focus toward the playoffs after finishing the regular season with a 107-97 loss at Chicago. Tyrus Thomas scored a season-high 26 points to lead Chicago (33-49) in what might have been interim coach Jim Boylan's last game with the Bulls. While Thomas finished one shy of his career scoring high, rookie Aaron Gray set career-highs with 19 points and 22 rebounds. Luol Deng scored 32 points and Ben Gordon added 29 as the Chicago Bulls barely fell short for most points in franchise history in a 151-135 victory over the Bucks in Milwaukee. Chris Duhon had 22 points and 15 assists for Chicago (32-49), which fell five points short of its scoring record of 156 set March 16, 1984 at Portland, and four points short of its regulation record set against Phoenix on Dec. 4, 1990. Andres Nocioni recorded 22 points and five rebounds and Luol Deng scored 19, but the Bulls couldn't overcome the visiting Magic, falling 104-84. Chicago, which forced Orlando to commit 16 turnovers, played a solid second quarter when it outscored its opponent by seven. While LeBron James made it look easy early on, tying his team record by scoring 24 of his 34 points in the first quarter, the Chicago Bulls eventually found a clear path to the rim and beat Cleveland 100-95 at the United Center. Luol Deng led the Bulls with 21 points. Tyrus Thomas added 20 points and 14 rebounds, Joakim Noah chipped in 17 and 11 for Chicago, which improved to 31-48. The Bulls could not overcome a double-digit deficit in the third quarter as they lost to the host Orlando Magic, 115-83. Kirk Hinrich led Chicago with 19 points, while Ben Gordon and Aaron Gray each scored 13. Tyrus Thomas tied a career high with five blocks. Chicago (30-48) drew within 78-70 on a 17-7 run in the third quarter, but no closer. The Bulls scored just two points in the fourth quarter's first 2 1/2 minutes. The Bulls' string of postseason appearances officially came to an end with a 95-88 road setback to the Miami Heat. Luol Deng led the Bulls with 25 points, 19 of which came in the first half. Ben Gordon and Joakim Noah each added 16 points. The Bulls fell to 30-47 and were officially eliminated from the Eastern Conference playoffs after making three consecutive appearances. Playing without the injured Antawn Jamison and Gilbert Arenas, the Wizards got a career-high 25 points from Brendan Haywood, 18 from Caron Butler and a 99-87 victory over the Chicago Bulls. With Atlanta beating Philadelphia, the 11th-place Bulls fell 5 1/2 games out of the eighth and final playoff spot. Chicago could squeeze in on a tiebreaker if it wins its final six games and the Hawks lose their remaining five, but the Bulls also have to jump over Indiana and New Jersey. The Bulls (30-46) got 18 points from Ben Gordon and 16 from Larry Hughes in the defeat. Ben Gordon made five clutch free throws down the stretch and Larry Hughes scored 19 of his 25 points in the second half against his former team, rallying the Bulls to a 101-98 win over the Cleveland Cavaliers. The Bulls (30-45) overcame a 17-point deficit in the second half and snapped a six-game road losing streak. Hughes, traded by the Cavaliers to Chicago at the Feb. 21 deadline, added nine assists and eight rebounds in 45 minutes. Gordon scored 24 points and Luol Deng and Andres Nocioni had 15 each. Tyrus Thomas led all scorers with 24 points, but the Bulls were slowed down the stretch in a 106-92 loss to the Celtics at the United Center. Andres Nocioni added 19 points and Luol Deng finished with 10 in the loss. The Bulls (29-45) were outscored 27-19 in the decisive fourth quarter. With eight games left, the 11th-place Bulls trail Atlanta by five and have to climb over New Jersey and Indiana to make their fourth straight postseason appearance. Joakim Noah had a season-high 18 points, 15 rebounds and four blocks to lead the Bulls to a 114-111 victory over the Milwaukee Bucks after nearly squandering a 21-point lead in the fourth quarter. Larry Hughes scored 19 points and Luol Deng added 16 to help the Bulls (29-44) win for just the fourth time in 12 games. Chicago pulled 3 1/2 games behind eighth-place Atlanta for the final playoff spot in the Eastern Conference. The Atlanta Hawks nearly let one slip away, but their playoff hopes got a major boost when Ben Gordon's fourth-quarter barrage came up just short. Mike Bibby scored 30 points and the Atlanta Hawks held on after nearly blowing two huge leads, beating the Chicago Bulls 106-103 to strengthen their hold on the Eastern Conference's final playoff spot. Gordon, who scored 16 of his 18 points in the final period, had a chance to force overtime but his final shot rimmed out as the horn sounded. Luol Deng scored 19 points to lead the Bulls (28-44). The Bulls got off to a slow start in Philadelphia and could not recover in a 121-99 setback to the 76ers. Thabo Sefolosha led the Bulls with 20 points, Kirk Hinrich had 18 and Andres Nocioni 16. Drew Gooden, who scored a season-high 31 points and matched a season best with 16 rebounds in a victory over Atlanta the night before, was held to two points and eight rebounds for Chicago (28-43). Drew Gooden hit his first five shots and finished with a season-high 31 points while matching a season best with 16 rebounds in the Bulls' 103-94 victory over the Atlanta Hawks. It was his best performance since joining the Bulls in a trade from Cleveland. Ben Gordon's 3-pointer with 1:27 to go gave the Bulls (28-42) a 97-90 lead, and he added two free throws with 28 seconds left. Gordon finished with 16 points. Luol Deng led all scorers with 28 points and had eight boards, but the Bulls were slowed in the fourth quarter in a 108-101 loss to the Indiana Pacers at the United Center. Ben Gordon added 21 points for Chicago (27-42), which was outscored 35-17 in the final 12 minutes. The Bulls lost for the sixth time this season after taking the lead into the fourth quarter. Tim Duncan was too steady and strong on the inside, and Tony Parker darted through and around Chicago's defense as the San Antonio Spurs defeated the host Bulls 102-80 to stop their losing skid at four games. Luol Deng led the Bulls with 18 points and Drew Gooden added 16 as Chicago (27-41) fell two games behind the eighth and final Eastern Conference playoff spot. The Bulls used a 21-point second quarter advantage to vault themselves to a 112-96 home win over the New Jersey Nets. Ben Gordon scored 10 of his 17 points in the fourth quarter and Larry Hughes added 16 in Chicago's balanced attack. Luol Deng scored 20 points, and Drew Gooden had 19 points and 11 rebounds for the Bulls (27-40). The St. Patrick's Day uniforms gave the Bulls no fourth-quarter luck against the Hornets as a lead slipped away in a 108-97 loss at New Orleans. Ben Gordon scored 31 points off the bench for Chicago (26-40), which fell 2 1/2 games behind Atlanta for the final playoff spot in the Eastern Conference. Drew Gooden added 23 points and 12 rebounds for the Bulls. The Bulls led by 18 points in the fourth quarter but could not hold off a Sixers' rally as they absorbed a 110-106 home loss. Philadelphia trailed 88-70 with 11:08 left, then outscored the Bulls 18-6 for the win. Luol Deng led Chicago (26-39) with 21 points. Thabo Sefolosha added 20 points in a reserve role and Larry Hughes had 15 points, five assists and seven rebounds for the Bulls. Drew Gooden tied a season high with 24 points, Ben Gordon added 19, and the Bulls beat Utah 108-96 to snap the Jazz's five-game winning streak. Gordon hit several key 3-pointers for Chicago (26-38), including two late in the third quarter and one midway through the fourth after the Jazz pulled within 10. That was enough to offset strong performances by Utah's Mehmet Okur (22 points, 18 rebounds) and Deron Williams (20 points, 10 assists). The Bulls kept it close all the way but could not overcome the Pistons down the stretch as they absorbed a 116-109 road loss in Detroit. Tayshaun Prince scored 15 points in the final 17 minutes to help the Pistons clinch their seventh straight playoff berth with the win. Ben Gordon led Chicago (25-38) with 27 points and Luol Deng added 21, but it wasn't enough to prevent the Bulls from losing to a top Eastern Conference team for the second time in three nights. Seeking their third straight win, the Bulls fell behind early to the league-leading Boston Celtics and could not recover in a 116-93 road loss. Ben Gordon scored 20 points to lead five players in double figures. The Celtics had 20 foul shots in the second quarter to three for Chicago (25-37), leading Bulls forward Drew Gooden to complain and draw two technicals. Joakim Noah had 10 points and seven rebounds for the Bulls. Ben Gordon and Luol Deng scored 23 points apiece, and Chicago overcame LeBron James' 39 to beat the Cleveland Cavaliers 107-96 at the United Center. The Bulls (25-36) went on a 17-point run early in the third quarter to grab a 66-53 lead, and Gordon scored nine straight during a 51-second burst late in the period to make it a 17-point game. That was enough to give Chicago back-to-back wins for the first time since late December and offset another strong effort by James. Joakim Noah grabbed a career-high 20 rebounds while scoring 13 points. Drew Gooden and Luol Deng scored 21 points apiece, and the Chicago Bulls withstood a second-half push by Memphis to win 112-97 and extend the Grizzlies' losing streak to nine games. The Bulls (24-36) scored 13 straight to turn a nine-point advantage into a 54-32 lead late in the second quarter, increased it to 30 in the third and hung on. Kirk Hinrich added 19 points, 12 assists and a career-high four blocks, while Andres Nocioni scored 20. Ben Gordon chipped in 16 points for Chicago, which had dropped four of five. LeBron James scored 37 points and took over down the stretch to lead the Cleveland Cavaliers to a 95-86 victory over the visiting Chicago Bulls. The Cavaliers trailed 76-68 early in the fourth quarter, but rallied to tie the game and took the lead for good with 3:04 to go. Larry Hughes led the Bulls (23-36) with 23 points, making 8 of 20 shots from the field. Drew Gooden scored 11 points with 10 rebounds and four other Chicago players reached double digits in the defeat. Andres Nocioni hit three 3-pointers and finished with 19 points while Luol Deng added 18 points and 11 rebounds, but the Bulls (23-35) lost a 97-91 decision to the Wizards at the United Center. Larry Hughes chipped in 16 points and a season-high-tying six assists in his first home game in a Chicago uniform. The Wizards started the third quarter on a 22-1 run and outscored the Bulls 35-14 in the period to turn a 52-34 deficit into a 69-66 lead, a quick and stunning turnaround for a team that shot just 27.9 percent in the first half. Larry Hughes had 29 points and Drew Gooden added 10 points and 15 rebounds, helping the Chicago Bulls beat the Pacers 113-107 in Indiana. It was their first victory since the duo was acquired from Cleveland on Feb. 21 as part of a three-team trade. Luol Deng finished with 16 points and Ben Gordon scored 15 for the Bulls (23-34). With the score tied at 82, the Bulls scored the first seven points of the fourth quarter, including five by Andres Nocioni, to open a seven-point lead and never looked back. Ben Gordon led with 25 points, but the Bulls fell behind by 10 at the half in an eventual 102-94 road loss to the Mavericks. Drew Gooden finished with 17 points and eight rebounds and Larry Hughes added 14 points for Chicago (22-34), which had five players in double figures. In his first home game for Dallas in more than 11 years, and since being traded from New Jersey, the All-Star point guard Jason Kidd had 11 points with nine rebounds and eight assists. Tyrus Thomas scored 18 and Larry Hughes added 13 in his Chicago debut, but it wasn't enough as the Bulls (22-33) dropped a 110-97 decision in Houston to the red-hot Rockets. Drew Gooden, also making his debut, finished with 12 points and eight rebounds. Tracy McGrady had 24 points and eight assists as the Rockets won their 16th game in their last 17. Ben Gordon scored 37 points, and the revamped Bulls delivered their best offensive effort in years, overcoming a surge by Denver to beat the Nuggets 135-121. The 135 points were the most since a 140-96 thumping of New Jersey on Jan. 4, 1991. And the Bulls (22-32) scored at least 30 in all four quarters for the first time since a 134-123 win over Denver on Feb. 18, 1997. They did all that one day after sending Ben Wallace and Joe Smith to Cleveland for Drew Gooden and Larry Hughes, just before the trade deadline in a deal that also involved Seattle. The Bulls had eight players score in double digits in New Jersey, but came up short against the Nets, falling 110-102 in overtime. Joe Smith led Chicago (21-32) with 17 points and nine rebounds, while Ben Gordon scored 14 points after missing five games with a right wrist strain. Luol Deng, who had missed 16 of the last 21 games with left Achilles' tendinitis, had 13 points. Kirk Hinrich scored 24 points to lead the Chicago Bulls to a 99-92 victory over Miami and send the Heat to their 24th loss in 25 games despite a combined 53 points from Dwyane Wade and Shawn Marion. Joe Smith had 19 points and 11 rebounds for Chicago and Andres Nocioni scored 18. Sefolosho added 17 points and 12 rebounds. The Bulls (21-31) also got 10 points, 12 rebounds and four blocks from Tyrus Thomas, who started in Ben Wallace's place. Wallace missed the game because of a death in his family. Andres Nocioni scored a game-high 28 points on 8-for-15 shooting, but the Chicago Bulls lost a hard-fought 100-86 decision to the New Orleans Hornets at the United Center. Kirk Hinrich chipped in 15 points and four assists in his return from injury, while Ben Wallace contributed nine along with his 16 rebounds. After trailing 50-43 at halftime, the Hornets outscored the Bulls (20-31) 29-18 in the quarter and held on for the victory. Back at home and against an injury-riddled Chicago lineup, Utah looked more like the team that won 10 straight games than the one that lost by 13 points the night before. The Jazz beat the Bulls 97-87, pulling away after Chicago had cut a 14-point lead to two. Thabo Sefolosha led with 22 points as the Bulls (20-30) concluded a six-game road trip. Joe Smith and Andres Nocioni each finished with 14 points. Chris Duhon posted 11 points and eight assists in the loss. Chris Duhon scored a career-high 34 points, Joe Smith had 27 and the undermanned Bulls hung on for a 114-108 victory in Oakland, spoiling Chris Webber's return to Golden State after a 13-year absence. With Ben Gordon, Luol Deng and Kirk Hinrich all sidelined, Duhon's 11-of-16 shooting, four 3-pointers and nine assists carried the Bulls (20-29) early as they somehow stayed in front of the well-rested Warriors. Tyrus Thomas then took over late, getting 13 of his 15 points in the fourth quarter as the Bulls scored on nine of 10 possessions down the stretch. The Bulls fought back through the fourth quarter, but the last second, cross-court pass came up short and Chicago fell in Portland, 100-97. Andres Nocioni and Thabo Sefolosha led the way with 22 points each. Chicago guard Kirk Hinrich wasn't in the lineup because of bruised ribs. Hinrich, averaging 13 points, six assists and 3.5 rebounds, was injured in the team's victory at Seattle. Chris Duhon started in his place for the Bulls (19-29), finishing with nine points and nine assists. Joe Smith returned to the starting lineup to score 25 points and the Chicago Bulls defeated the host Seattle SuperSonics 118-108. He had been sidelined for two games the week before with a sore knee and then the flu. The Bulls (19-28), still playing without second-leading scorer Luol Deng and the final quarter without Kirk Hinrich, also got 20 points from Ben Gordon. Hinrich added 15 points before leaving with a rib injury, while Andres Nocioni and Aaron Gray each had 14 in Chicago's third-highest scoring game of the season. Ron Artest scored 28 points and Kevin Martin had 26 to help the Kings win their season-best fourth straight game, a 105-101 victory over the Chicago Bulls. Ben Gordon scored 15 of his 33 points in the fourth quarter. Kirk Hinrich scored 18 points, Joakim Noah had 10 and Ben Wallace added nine points and nine rebounds for the Bulls (18-28), who have lost nine straight road games. Thabo Sefolosha scored a team-high 14 points, but the Bulls struggled in Minnesota, coming up short to the Timberwolves and falling 83-67. Kirk Hinrich also had 14 points and nine assists for Chicago, but was just 5-for-17 from the field and the Bulls (18-27) committed 22 turnovers and shot 33.3 percent. Their 67 points were a season low. The banged-up Bulls were missing Ben Gordon, Luol Deng and Joe Smith. Kirk Hinrich finished with 27 points after a rough start, and the Bulls beat the Minnesota Timberwolves 96-85, spoiling Randy Foye's return from a knee injury. Foye, sidelined all season by a a stress reaction in his left kneecap, scored 11 points in 17 minutes and felt fine afterward. Hinrich hit a jumper midway through the third quarter to break a 49-49 tie after missing 11 of his first 12 shots. His layup two minutes later made it 57-55, and the Bulls started to pull away. He scored 12 points in the period as Chicago (18-26) built a 71-62 lead. Andres Nocioni added 18 points for the Bulls. Amare Stoudemire scored 24 points and the Phoenix Suns pulled away early in the fourth quarter to beat the Chicago Bulls 88-77 at the United Center. Leandro Barbosa scored 13 and started a 12-0 run in the fourth with a baseline drive and two 3-pointers, sending the Suns to their sixth win in seven games. Kirk Hinrich did all he could to keep the Bulls (17-26) in the game, finishing with 31 points - the second time in less than a week he scored more than 30. Tyrus Thomas added 10 points and 11 boards off the bench. Emeka Okafor scored 21 points and had 16 rebounds and Gerald Wallace added 21 points to help Charlotte beat the injury-depleted Bulls 90-77 at the United Center. Chicago played without its top two scorers, Ben Gordon (wrist) and Luol Deng (Achilles tendinitis), and Charlotte held the Bulls to 37 percent shooting. Andres Nocioni led Chicago (17-25) with 25 points while Thabo Sefolosha doubled up with 13 points and 10 rebounds. Kirk Hinrich scored a career-high 38 points, and the Chicago Bulls beat the Indiana Pacers 108-95 at the United Center even though Luol Deng and Ben Gordon were sidelined with injuries. Hinrich, who hit 14 of 21 shots and also had 10 assists, scored 12 points in the fourth quarter and left to a loud ovation with 40 seconds left. Andres Nocioni added 24 points, including six during a 17-0 run in the second quarter that snapped a 29-all tie and put the Bulls ahead for good. Rookie Joakim Noah added 14 points and a season-high 15 rebounds for Chicago (17-24). Mike Miller and Rudy Gay each had 24 points and 10 rebounds, and the Memphis Grizzlies beat the Bulls 104-90. Ben Gordon led the way with 25 points, and Andres Nocioni had 16 points. Luol Deng added 13 points and Kirk Hinrich scored 12 points for Chicago (16-24), which shot just 36.5 percent from the field while Memphis connected on 52 percent of its shots. Billups: Bulls have "had our number"
Ben Gordon had 33 points Saturday night and the Bulls came up with some tough fourth-quarter defense that has been lacking this season to beat the Detroit Pistons 97-81. The Bulls (16-23) are now 3-0 against the team that eliminated them in the Eastern Conference semifinals in six games last spring. Chicago's Andres Nocioni scored 21 points in place of the injured Luol Deng, who was out with a sore Achilles' tendon. And guard Thabo Sefolosha pitched in 12 points and a career-high 13 rebounds for the Bulls. For the first time in nearly seven years, the Bulls were beaten at home by the Golden State Warriors, dropping a 119-111 decision. Ben Gordon scored 29 points and fellow reserve Andres Nocioni contributed 28. The Bulls (15-23) just couldn't contain the quick-scoring Warriors, especially in the second half. With Baron Davis making six 3-pointers - he was 5-for-5 in the third quarter en route to 40 points for the game - and Stephen Jackson scoring 12 of his 24 in the fourth quarter, the Warriors got the hard-earned road win with a strong finish. Ben Gordon scored 24 points, Joe Smith added 23 and the Bulls handed Miami its 11th straight loss, beating the Heat 126-96 to close out a four-game road trip. Luol Deng had 21 points and Andres Nocioni rebounded from an injury in Tuesday's loss at Orlando to score 20 points. Thabo Sefolosha scored a season-high 17 points for the Bulls (15-22), whose 126 points were a season high. Miami pulled to 62-60 at 9:03 of the third, but the Bulls went on a 10-3 run and never looked back, taking a 93-79 lead into the fourth period. After getting off to a good start, the Bulls surrendered the lead in the second quarter and were unable to climb back in a 102-88 loss at Orlando. Chicago, which was outscored 32-10 in the decisive third period, had only three players in double figures. Joe Smith led the way with 13 points, rookie Joakim Noah had 12 and a career-best 11 rebounds and Luol Deng added 10. Orlando led only 57-52 at halftime, but limited the Bulls to just 21.4 percent (3-for-14) shooting in the third period to run away with the game. Joe Johnson scored 37 points, including 25 in the first half, and the Hawks beat the Bulls 105-84 in Atlanta to end a 12-game losing streak in the series. The Hawks had not beaten the Bulls since a 116-101 victory on April 9, 2004. Luol Deng led Chicago (14-21) with 28 points in his return from missing three games with a sore Achilles' tendon. Andres Nocioni had 20 points, Joe Smith 12 and Kirk Hinrich 11 for Chicago. Andres Nocioni scored 27 points, Joe Smith added 19 and the Bulls rallied to beat the 76ers 100-97 in Philadelphia. Ben Gordon scored 15 points and Kirk Hinrich had 11 as Chicago improved 5-3 under interim coach Jim Boylan. Chicago (14-20) quickly fell behind 25-7 late in the first quarter thanks to poor shooting. From that point, the Bulls outscored the Sixers 38-15 to take a 45-40 advantage at halftime. The Bulls were 13-of-20 from the field in the second quarter and outscored the Sixers 31-13 to regain the lead. With Luol Deng (strained Achilles tendon) watching from the sidelines, the Bulls lost a heartbreaker to the Knicks at home, 105-100. Joe Smith led the Bulls (13-20) with 22 points and 12 rebounds, while Ben Gordon and Kirk Hinrich added 21 and 20 points each. The Knicks trailed by 13 early in the fourth and were down 98-91 after Smith hit a turnaround jumper midway through the quarter. But they ended the game on a 14-2 run. Ben Wallace hit the first of two free throws with 3.2 seconds remaining and then blocked Brad Miller's jumper with about a second left to lift the Bulls to a 94-93 victory over the Sacramento Kings. With Luol Deng sitting out because of left Achilles' tendinitis, Andres Nocioni started and rewarded the Bulls (13-19) with 26 points and five rebounds. He scored 13 in the first five minutes and never slowed down, hitting 5-of-7 3-pointers and going 7-of-10 overall from the field. Portland's Jarrett Jack drove for a go-ahead basket and converted a three-point play with 19 seconds left in the second overtime as the Trail Blazers outlasted the Chicago Bulls 115-109 for their 15th win in 16 games. Ben Gordon scored 32 points to lead the Bulls (12-19) and Joe Smith added a season-high 31 as Chicago dropped to 3-2 since Jim Boylan was appointed interim coach. Luol Deng left in the second quarter with tightness in his left Achilles' tendon. Interim Head Coach Jim Boylan improved to 3-1 as the suddenly resurgent Bulls rallied to beat the host Charlotte Bobcats 109-97. Ben Gordon (22 points) had his fourth straight strong game since becoming the sixth man, and Luol Deng added 21 points and 13 rebounds for Chicago (12-18). 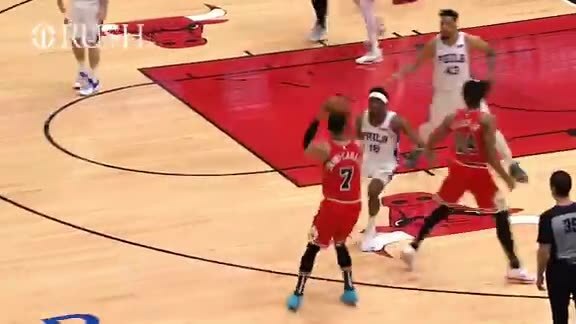 But it was Boylan's decision to go with a big lineup featuring Joakim Noah that sparked the Bulls' comeback from a 12-point third-quarter deficit. Hedo Turkoglu hit a fadeaway jumper with seven-tenths of a second left in overtime, and the Orlando Magic beat the Bulls 112-110. After Chicago's Ben Gordon hit a tying 3 with 6.7 seconds left, Turkoglu made a shot over Ben Wallace. The Magic's fourth win a row was secure when Wallace missed from midcourt at the buzzer. Gordon led Chicago (11-18) with a season-high 39 points and Luol Deng added 21. Kirk Hinrich finished with 10 points and 10 assists before fouling out in the fourth quarter. Jim Boylan got a new job, then asked Ben Gordon to accept an old one. That made it two moves, two wins for the Chicago Bulls. Gordon scored 25 points in his second consecutive strong performance since returning to a reserve role, leading the visiting Bulls to a 100-83 victory over the New York Knicks. Luol Deng added 17 points for the Bulls (11-17), who improved to 2-0 since Boylan became the interim head coach. Jim Boylan's debut as interim head coach of the Chicago Bulls was a winner because of a major change he made soon after getting the job. Boylan asked Ben Gordon to give up his starter's role and come off the bench to give the stumbling team an offensive lift. Gordon scored 19 of his 31 points in the final quarter as the Bulls beat the Milwaukee Bucks 103-99. Luol Deng added 28 for Chicago (10-17). The defending champion Spurs handily beat the visiting Bulls 94-79 in Chicago's first game since the dismissal of Scott Skiles Joe Smith had 19 points and 11 rebounds, and Ben Gordon added 18 points for the Bulls (9-17). Assistant coach Pete Myers, who played in the NBA for eight years, served as interim coach for Chicago . While the Bulls came out with energy and went up by five points early, they couldn't get into an offensive groove and lost for the fourth time in five games. Kirk Hinrich scored 22 points and Luol Deng added 21, but the Bulls couldn't hang with the visiting Rockets, falling 116-98 at the United Center. With the Bulls (9-16) leading 28-27, the Rockets went on a 14-3 run in the second quarter with Yao Ming and Tracy McGrady off the floor, to give the Rockets the lead for good. The Bulls were outrebounded 50-34 in what would become Scott Skiles last game as the team's head coach. The Bulls had won four straight in Boston, but that streak came to an end with a 107-82 loss as Chicago met up with the Celtics' new trio of stars. Ben Gordon scored 19 for Chicago (9-15), and rookie Aaron Gray had 14 to reach a career-high for his second consecutive game filling in for the injured Ben Wallace. Tyrus Thomas grabbed nine rebounds for the Bulls, who had won eight straight overall against Boston prior to this season. Ben Gordon posted 22 points and Luol Deng added 20 as the Bulls closed with a strong fourth-quarter run to earn a 95-84 road win over the Washington Wizards. Chicago (9-14) ended the game with a 16-4 run as Gordon accounted for the team's final six points. Rookie center Aaron Gray had career highs in points (10), minutes (29), rebounds (10) and assists (five). Luol Deng poured in a game-high 26 points, but the Bulls went cold for a five-minute stretch in the fourth quarter that contributed to a 103-91 loss to the Lakers at the United Center. Kirk Hinrich, coming off a triple-double, tallied 17 points, eight assists and five rebounds for Chicago (8-14). Luol Deng scored 29 points, Kirk Hinrich produced the second triple-double of his career, and the host Bulls handed New York its fifth straight loss, 101-96. Deng scored 23 points in the second half, and finished with 10 rebounds for Chicago (8-13). Hinrich scored 15 points, tied a season-high with 14 assists and set one with 12 rebounds. His only other triple-double was against Golden State on Feb. 28, 2004. Ben Gordon led five players in double figures with 18 points, but the Bulls relinquished a 16-point first-half lead and fell to the Indiana Pacers, 117-102, at Conseco Fieldhouse. Joe Smith scored 16 points and Luol Deng added 15 for Chicago. The Bulls (7-13) entered the game ranked eighth in the league in scoring defense, but they allowed their highest point total of the season. Ben Gordon scored 27 points, Luol Deng added 20, and the Chicago Bulls scored their most lopsided victory of the season by pounding the Seattle SuperSonics, 123-96. Chicago (7-12) converted 53.7 percent of its field goals in the contest. The Bulls led 67-49 at halftime after outscoring the Sonics by 14 in the second quarter and never let up. Andres Nocioni was among five Bulls in double figures with a team-high 18 points, but Chicago's late rally fell short in a 92-81 home loss to the Celtics. Nocioni capped an 11-0 run in the final minute that pulled the Bulls (6-12) within five before Boston closed with six unanswered points. Kirk Hinrich added 16 points and six assists, while Luol Deng scored 15. The Bulls fought their way to a 98-91 victory in Detroit, putting a stop to the Pistons' five-game winning streak. Andres Nocioni led Chicago with 22 points, while Joe Smith and Ben Wallace dominated in the paint, grabbing 14 and 13 rebounds, respectively. Wallace added 10 points as the Bulls (6-11) improved to 5-1 in the regular season against Detroit since he joined the team last season. Two nights after he scored 30 points off the bench, Andres Nocioni scored 10 of his 15 points in the fourth quarter and added 11 rebounds as the Bulls (5-11) rallied to send the host Charlotte Bobcats to their seventh straight loss, 91-82. With Luol Deng controlling the inside with 30 points and Nocioni hitting big shots from the outside, the Bulls erased an 11-point third-quarter deficit by outscoring the Bobcats 38-22 in the fourth. Despite a late rally to make it a one-possession game in the closing seconds, the Bulls lost to the visiting Dallas Mavericks, 103-98, at the United Center. Andres Nocioni had 30 points, while Kirk Hinrich added 18. Hinrich, who was benched in favor of Chris Duhon to start the second half, scored 14 of his 18 points in the fourth quarter for Chicago (4-11). The Bulls earned a convincing 90-78 victory over the Hawks at the United Center, beating Atlanta for the 12th straight time and extinguishing the Hawks' hope for three consecutive road wins. Luol Deng led all scorers with 22 points, and Tyrus Thomas and Ben Wallace grabbed 12 rebounds apiece for Chicago (3-10). Chicago led by as many as nine in the second quarter, but fell behind before the half and never recovered in a 93-78 loss to the Raptors in Toronto. Luol Deng posted 21 points and nine rebounds in his return to Chicago's starting lineup after missing the previous three games with a sore lower back. Ben Gordon added 17 points and six assists for the Bulls, who fell to 2-10. Despite 23 points and nine rebounds from Andres Nocioni, the Bulls couldn't prevent New York from ending its eight-game losing streak in an 85-78 loss at Madison Square Garden. Starting forward Luol Deng missed his third consecutive game with lower back pain for Chicago, which dropped its third straight and fell to 2-9. The Bulls were defeated by the streaking Nuggets in Denver, 112-91. Rookie Joakim Noah led the team in scoring with 16 points, adding eight rebounds. Kirk Hinrich and rookie Thomas Gardner had 14 points apiece for Chicago, which dropped to 2-8. Carmelo Anthony scored 26 points for the Nuggets, who won their sixth straight. Ben Gordon posted a game-high 20 points, but the Bulls (2-7) were unable to overcome a slow start to the second half as they fell to the Lakers, 106-78, at the Staples Center. Andres Nocioni poured in 14 points, while Kirk Hinrich notched eight points and eight assists. The Los Angeles substitutes outscored their Chicago counterparts 73-31, and the Lakers outrebounded the Bulls 51-38. Ben Gordon posted 25 points as the Bulls never trailed in their 92-73 victory over the Clippers in Los Angeles. Andres Nocioni scored 21 points and Luol Deng added 10 to help Chicago (2-6) notch its first road win of the season. Ben Wallace tallied 13 rebounds and six steals. The Bulls rallied from 14 down in the third quarter to take the lead in the fourth, but fell short to the Suns in Phoenix, 112-102. Ben Gordon scored 24 and Luol Deng had 23 for Chicago (1-6), which played the first of a six-game road trip. Leandro Barbosa made five of seven 3-pointers, and Phoenix newcomer Grant Hill added 24 points on the heels of his 21-point effort against New York two nights earlier. After an impressive home win against Detroit, the Bulls failed to defend their homecourt in the following contest, losing to the Toronto Raptors, 101-71. Andres Nocioni led with 20 points to leadh Chicago (1-5), while Ben Gordon added 11. Bulls coach Scott Skiles cleared his starters from the floor with 9:35 left in the third quarter. Luol Deng, Tyrus Thomas, Ben Wallace, Gordon and Kirk Hinrich never returned to the game. Despite four players scoring in double figures, the Bulls fell to the Clippers at the United Center, 97-91. Luol Deng led the way with 22 points and eight rebounds and Kirk Hinrich chipped in with 18. Joe Smith managed 17 points and seven rebounds off the bench for Chicago (0-4). Cuttino Mobley scored 33 points and Corey Maggette added 18 points, 10 rebounds and five assists to lead L.A.
Ben Gordon scored seven of his team-high 15 points in the fourth quarter, but it was not enough as the Bulls fell short against the host Bucks, 78-72. Joe Smith tallied 14 points and 10 rebounds, while Andres Nocioni scored 12. Milwaukee snapped a 15-game losing streak to Central Division opponents dating back nearly a year, and kept Chicago (0-3) winless through the first week of the season. Andre Iguodala scored 11 of his 22 points in the fourth quarter, Andre Miller added 25, and the Philadelphia 76ers hung on to beat the Bulls 96-85 at the United Center. Ben Gordon led Chicago (0-2) with 25 points. Second-year pro Tyrus Thomas had one of his best games, finishing with 21 points and a career-high 12 rebounds while blocking three shots. But it was a rough night for Luol Deng and Kirk Hinrich. Deng was 4-of-12 with 10 points and four rebounds, and Hinrich scored eight while shooting 3-for-12. The Bulls battled back from a 15-point halftime deficit and forced overtime in their season opener with the Nets, but New Jersey pulled away in the closing minutes and handed Chicago a 112-103 road loss. Ben Gordon had 27 points and Luol Deng added 22 points and 11 rebounds for the Bulls (0-1), who had been distracted by rumors of a possible trade for Kobe Bryant. Richard Jefferson had 29 points and 10 rebounds to lead the Nets to their 12th straight win over Chicago in New Jersey.